JOHN 16:33 KJV "These things I have spoken unto you, that in me ye might have peace. In the world ye shall have tribulation:..."
30Now are we sure that thou knowest all things, and needest not that any man should ask thee: by this we believe that thou camest forth from God. 31Jesus answered them, Do ye now believe? 32Behold, the hour cometh, yea, is now come, that ye shall be scattered, every man to his own, and shall leave me alone: and yet I am not alone, because the Father is with me. 33These things I have spoken unto you, that in me ye might have peace. In the world ye shall have tribulation: but be of good cheer; I have overcome the world. These things I haue spoken vnto you, that in me ye might haue peace, in the world ye shall haue tribulation: but be of good cheare, I haue ouercome the world. I have said all these things to you so that in me you may have peace. In the world you have trouble: but take heart! I have overcome the world. These things I have spoken to you, that in me ye may have peace. 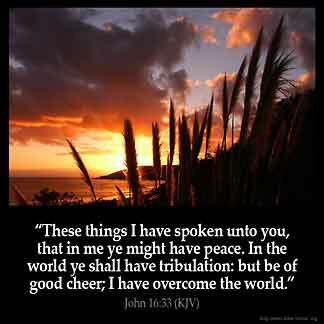 In the world ye will have tribulation, but be of good cheer: I have overcome the world. I have spoken all this to you in order that in me you may have peace. In the world you have affliction. But keep up your courage: *I* have won the victory over the world. These thingis Y haue spokun to you, that ye haue pees in me; in the world ye schulen haue disese, but trust ye, Y haue ouercomun the world. Joh 16:33 I have overcome the world. In this world his disciples would be persecuted and have sorrow, but he bids them Be of good cheer. The world can only afflict for a season; it is a conquered world; Christ has overcome it. Gives me hope in knowing no matter what our storms if we remain in Jesus he will get us through! Christ Jesus is the only solution to the world 's problems.Look unto Him and be courageous. Man shall not live by bread alone but by every WORD. satan is the god of this world and he never sleeps likes some Christian. With Christ on our side we are more than conquerors cause HE was tested but HE sinned not! I agree with Olabode.It is only through Jesus that we can have peace and overcome all the troubles that will come our way. The world is full of evil things such as trials, problems, challenges, oppressions, difficulties, etc. The only one that can give us victory peace over all aforementioned problems is JESUS. He came to destroy the works of the devil, so that you and i shall be set free from the camp of the devil. once you become a follower of Christ you categorically declare yourself an enemy of Satan.he will in all manners try to challenge you in order for you to back slide.this might be manifested in form of sickness,hatred by others,disappointment by others,lack of job,feeling to commit suicide,loneliness,disagreement,shortage of money,being cornered to corruption you ,know all sort of challenges to make you quit Christianity,that would make you renounce your faith in Christ,that would make you negate existence of the living God.but the bible says,happy are those who shall hold unto the end,who relinquish not their faith,you know it like disciple when sailing in the sea and strong winds and waves hit .who do you turn your eyes to?where does our help come from?